Your Modern Handyman: How Engineering and 3D Printing Can Solve Common House Problems. This week’s blog post is about how engineering and 3D printing can solve those annoying problems around your home. Here is an example from my apartment that I was able to solve. I had a problem with my coat hanger in my apartment. 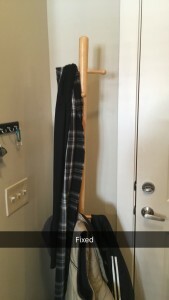 As you can see in picture 1 and 2, the top post of the coat hanger is too loosely connected to the bottom post and as a result is leaning to the right. I created a plastic cylinder insert piece (9.4mm by 38mm) to solve this problem. I made the part by 3D printing it with my Cube 3D printer. The whole process to design it and 3D print it was less than a few hours. Now the coat hanger no longer leans in the way of the front door! 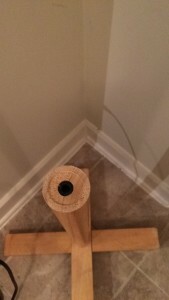 The top post was leaning because the hole that the top post fits into became too big from years of use (Picture 2) and as a result, the hanger wouldn’t stay vertical. The top post has a metal screw that is supposed to thread into the wood on the bottom. Now sure, I could have gone and purchased a new coat hanger for $10 from Walmart but what is the fun in that? So what I need to do was create a part that can provide some material for the screw to bite into. Since I have a 3D printer I knew I could print this part out of plastic. 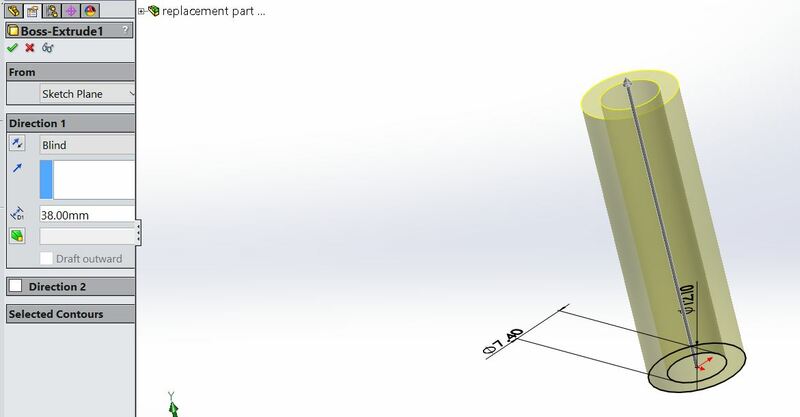 I measured (with calipers) the screw size and the hole size in the bottom post and from this information I created this plastic sleeve in Solidworks. 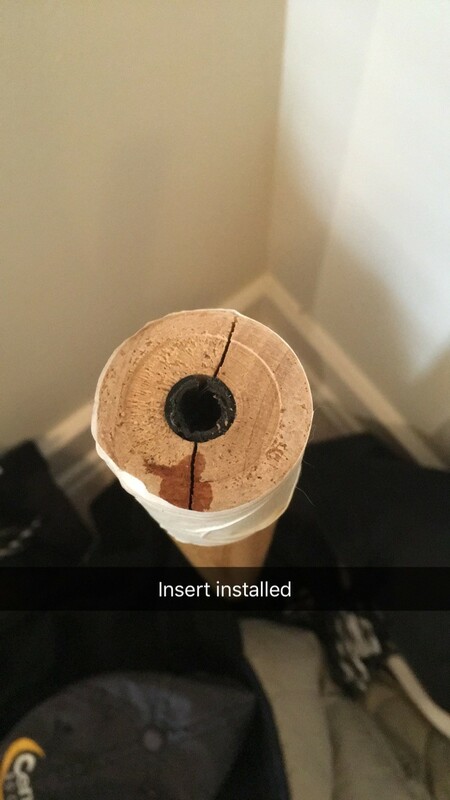 The inner diameter of the sleeve is a little smaller than the thread diameter of the post and the outer diameter of the sleeve matches the diameter of the current hole in the post. 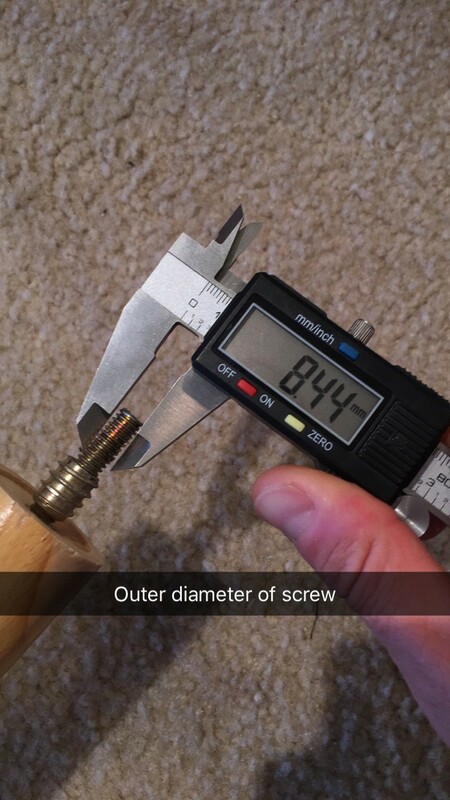 This provides some material for the screw to thread into. See Pictures 3 and 4. The screw outer diameter is 8.44mm and the inner diameter of the insert is 7.4mm, so there is 1.44mm of material for the screw threads to engage with. I designed the sleeve as a cylinder. To do this, I made a sketch with 2 concentric circle. The small circle is the inside of the cylinder and the large circle is the outside of the cylinder. Then I extruded this part the distance that is equal to the depth of the hole in the post. 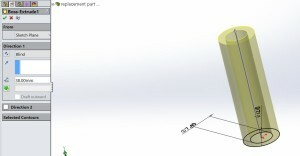 Next I created an STL file from the Solidworks file. An STL file is needed for 3D printing. My Cube 3D printer printed this sleeve and I installed it in the bottom of the coat hanger. See Picture 5. Once the sleeve was pushed in, I screwed in the top part and it solved my leaning coat hanger problem. 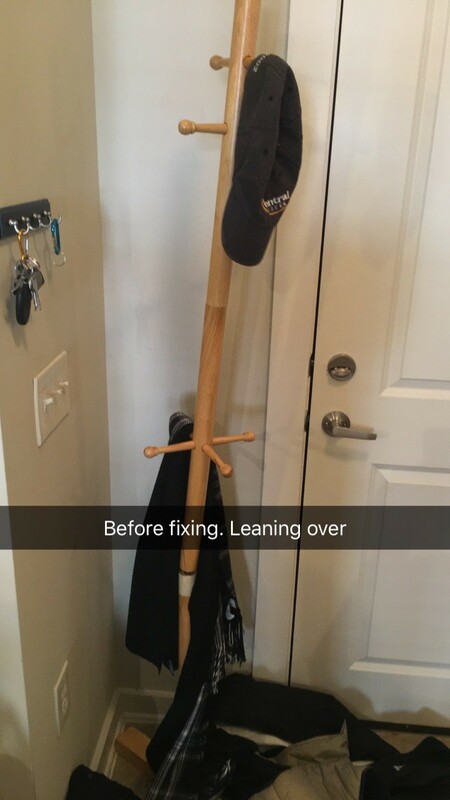 Now my guests can hang up their coats and my girlfriend can stop bugging me about fixing the coat hanger. See picture 6.